AOL’s Digital City just came out with a list of their top 12 ice cream spots throughout the United States. Great list with most notably Little Jimmy’s Italian Ice at #8. Click here Here for the AOL List. Out of the 12 listed we are the only Italian Ice mentioned in the AOL list, so I guess that makes us #1 in terms of Italian Ice- what do you think? Teacher supplements his income with a $1,000 a weekend ice cart business. He learned the difference between ice cream and Italian ice when he showed the site to his son, who’s quite a gourmet. “John said real Italian water ice is hard to find,” Frank comments. “We were so intrigued, we decided to visit the plant in New Jersey,” Young concludes. The business suits John Young on several levels-the initial investment is small, he can work as much or as little as he likes, and the whole family can participate. “Everyone feels good about ice cream; and the Italian water ice is healthy-moms feel good about that,” he explains. Little Jimmy’s traditional recipe has no milk, is extremely low in fat and carbohydrates, and resembles sorbet more than standard ice cream. If you’re interested in learning more about how you can start your own Italian ice cart business, contact the Jersey Ice Corporation. 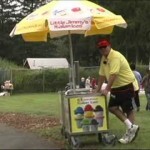 Jersey Ice Corporation produces Little Jimmy’s Italian Ice in Elizabeth, New Jersey. According to Dennis Moore, “Our grandfather started this business with only one Italian ice truck and one Italian ice-making machine nearly 75 years ago! Over the years the company has grown to include more than 100 privately owned trucks and approximately 150 pushcarts located throughout New Jersey. Our Italian ice is sold at the Jersey shore, pizzerias, company picnics, baseball stadiums, Liberty State Park (which services tourists visiting the Statue of Liberty and Ellis Island), and in our own store located in the Jersey Gardens Mall in Elizabeth, New Jersey. 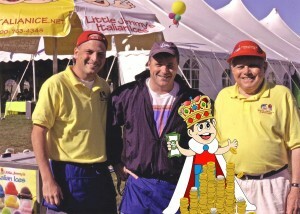 “Recently, due to the increase in demand, Jersey Ice is shipping Little Jimmy’s Italian Ice to entrepreneurs throughout the U.S. We believe this provides a great opportunity for us to expand our business and at the same time introduce our wonderful product to people who would not otherwise have a chance to enjoy our Italian ice,” said Moore. “We feel that our product is great for a brand-new start-up business in your area as well as an ideal addition to an existing store or business, and here is why: first, there is a high profit margin selling Italian ice; second, Italian ice provides a delicious dessert that is low in calories and contains no fat or dairy. “And while Italian ice is popular in the New York, New Jersey and Pennsylvania area, it is not well known in the rest of the country,” added the cart owner. “By retailing our product, you will be providing your patrons with the opportunity to experience something new, Little Jimmy’s Italian Ices, and soon they will love it as much as we do,” said Dennis Moore, ace entrepreneur. For more information, contact Jersey Ice Corporation, 655 Pennsylvania Avenue, Elizabeth, NJ 07201. The phone is 908/352-0666 and the fax number is 908-352-2476. SBOMAG.com © 2005 by Harris Publications, Inc. All rights reserved under International and Pan American Copyright Conventions. Reproduction in whole or in part without written permission of the publisher is strictly forbidden.